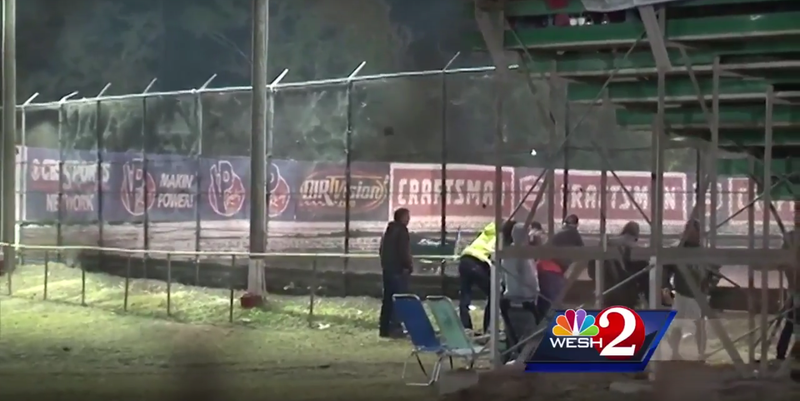 On Sunday, a sprint car competing in the World of Outlaws DIRTcar Nationals race at Volusia Speedway Park flipped over the catch fence at Turn 2 and into the stands, injuring three. This is the second car to have flipped over the fence at Volusia in a span of four days. Driver Dale Blaney (uncle of current NASCAR Cup driver Ryan Blaney) was racing side by side with several other cars going into Turn 1 at Volusia Speedway Park (located in Barberville, Florida, just a short drive from Daytona Beach) when the cars collided, sending Blaney’s sprint car up into the heavy guardrail that surroundes the track, and then over the top of the 10-foot catch fence at Turn 2. The car then rolled through the pit area near the grandstands, injuring three. The pits, where teams stage their cars and keep equipment to use in the race, are also not open to general admission spectators, per ESPN reporter Bob Pockrass. Blaney’s car kept rolling after it hit the people watching from the pits, and Blaney was able to get out of his car on his own once the car came to a halt, per the Orlando Sentinel. Blaney and the other drivers involved in the crash were not injured in the incident. The World of Outlaws race was paused for 80 minutes before it could be resumed, according to ESPN. Of the three fans hit in the crash, one had to be airlifted out of the speedway. Two remain in the hospital: 68-year-old Michael Brooks, who is in critical condition, and 35-year-old Kelly Kovski in stable condition, per ESPN. Kovski was working as the crew chief for Justin Allgaier’s dirt modified car at the event. The third person injured in the incident, Gary Streek, had been visiting the speedway from the United Kingdom. He was released from the hospital Monday morning. In a statement on the incident, World of Outlaws described the catch fence, which “relies on a combination of steel posts, wire mesh and heavy duty steel retention cables” as “common in motorsports applications” in their statement on the incident. However, one eyewitness who spoke to Jalopnik under conditions of anonymity confirmed that most of the large, fast tracks that are comparable to Volusia have taller fencing in front of areas where people are allowed to stand with better cables at the top that can catch a car before it flips into the stands. ﻿The safety and well being of every individual attending a World of Outlaws, whether as a participant in the pit area, a fan in the grandstand, a concession worker, race official or emergency responder is a priority. The World of Outlaws compete at the best dirt tracks in the country, we are constantly evaluating and implementing new procedures to improve safety at our events and have already begun that process in response to this weekend’s incident. The pit area closest to the track in Turn 2 was closed following the incident, reports ESPN. Additionally, the bleachers struck by a sprint car earlier in the week had been removed.